The folks at Glass Art Magazine did a cover feature on my work earlier this year and was planning on doing another article exclusively for their subs. 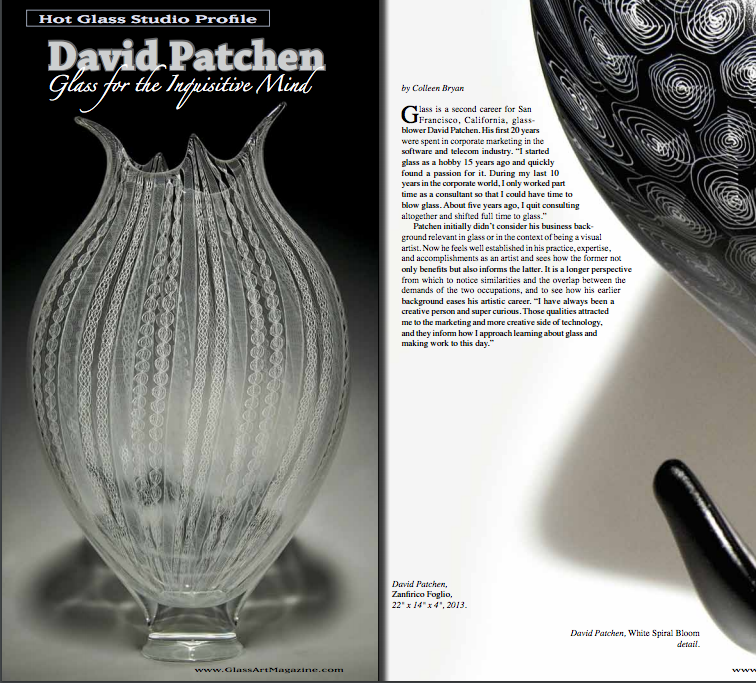 Well, they decided to make this second article, David Patchen: Glass for the Inquisitive Mind, available online so anyone who wants can check it out. It covers some different topics including how glass is my second career, my untraditional education and thoughts on music and visual arts. You can get a copy here. Permalink Submitted by Kimberly on Sun, 04/30/2017 - 3:02pm. Still workin on getting up there to watch you work, school is over May 23rd.... Sooo looks like end of May or early June- please tell me you are doing some funstuff at the kiln ?